Baseball fans generally remember players who are involved in some of game’s most famous events. The same can be assumed of players who are the first to accomplish a particular feat in the game. However, George Hall was both a central figure in one of major-league baseball’s earliest scandals and the first major-league player to earn the title of “home run king,” but is all but forgotten by the average baseball fan. Hall’s career ended abruptly in 1877 and he essentially vanished from the modern historical record. He was one of the better hitters of the era. His batting skill, involvement in some of early baseball’s famous events, and subsequent fall from grace make him one of the more colorful players in the 19th century. Hall began his baseball career as an amateur and played for the Excelsior Juniors of Brooklyn in 1868 and as a first baseman for the Cambridge Stars (New York) in 1868 and 1869. "3 In 1870 he joined the Brooklyn Atlantics and was responsible for ending the most famous undefeated streak in professional sports history. On June 14, 1870, the Cincinnati Red Stockings brought their unblemished 57-0 record to the Capitoline Grounds in Brooklyn to face the Atlantics. Henry Chadwick’s Base-ball Manual for 1871 estimated that nearly 10,000 people watched as the Atlantics and the Red Stockings played an intense match. Cincinnati led 3-0 after three innings, but the Atlantics rallied to score four runs in the following three innings. “The game now began to get quite exciting, and every movement of the players was watched with eagerness.”4 The teams traded the lead and were tied 5-5 after nine innings. Cincinnati refused to accept a tie-game outcome and sought to finish the match. In the 11th, the Atlantics tied the score again. Charles Ferguson was on second and George Zettlein at first. Hall batted next but what unfolded next is unclear. 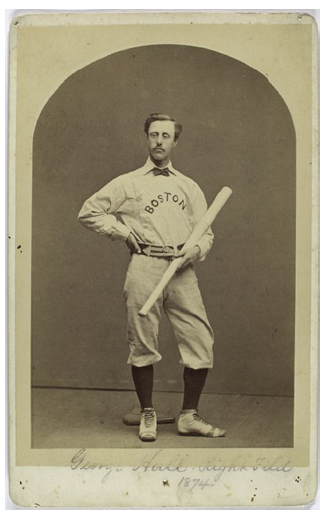 In 1874 Hall joined the best baseball club in the National Association, the Boston Red Stockings. The Red Stockings were crowned National Association champions in 1872 and 1873 and fielded a roster that included five future Hall of Famers— George Wright, Harry Wright, Jim O’Rourke, Deacon White, and Al Spalding. Although Hall’s career hitting statistics suggest he was a slightly above-average player, his addition to the best professional squad in the National Association speaks volumes. Both Wright Brothers, Andy Leonard, and especially Cal McVey knew how dangerous Hall could be with the bat. Additionally, McVey was Hall’s teammate in Baltimore in 1873, where the two batted .380 and .345 respectively. It’s possible that Harry Wright signed Hall at McVey’s urging. With Boston Hall split time in the outfield with the aging legend Harry Wright and others. The Red Stockings’ first National Association game of 1874 was against the New York Mutuals on May 2. Hall’s first professional contest played with Boston was a significant one as he replaced Harry Wright in the lineup, “filling (Wright’s) position acceptably at centre-field.”18 He had one hit, scored a run, and made two putouts in center field. But Hall’s season was mediocre– actually the worst of his professional career. This is possibly due to his limited playing time; Hall played in only 47 of the 71 scheduled league games. His role on the club was again as a rotating outfielder, splitting most of his time with Harry Wright. Hall batted .288 and had 64 hits, one home run, and 34 RBIs, all figures either career lows or close to them. Still, Hall played a role in one of baseball history’s grandest tours: the 1874 World Base Ball Tour. The Clipper called the tour “The Grand International Tour.”19 In the winter of 1873 Harry Wright proposed that the Red Stockings and Athletic of Philadelphia sail across the Atlantic in the summer of 1874 and expose Europeans to the American game. Hall returned to his country of birth on July 27, 1874, and played his first game on July 30 at the Liverpool Cricket Grounds in front of 500 onlookers. He scored two runs in the 14-11 loss to Athletic. On July 31 Hall hit one of Boston’s five home runs as the Red Stockings beat the Athletic, 23-18. This trend continued for the entire tour as he proved to be an offensive force. He hit in every game but one and belted at least two home runs. "20 The London Times noted that Hall was a good fielder. "21 He established himself as one of the best players on the tour. The teams returned to America on September 9. The tour proved to be a financial failure; the English reacted indifferently to the American game. “Some American athletes are trying to introduce us to their game of base-ball, as if it were a novelty; whereas the fact is that it is an ancient English game, long ago discarded in favour of cricket,” the Times lectured. "22 The Red Stockings completed their season on October 30 with a loss to Hartford. Boston finished 1874 atop the National Association standings with a 52-18-1 record. Despite playing for a champion, Hall signed with the Athletic of Philadelphia for the 1875 season. The reasons are unknown but Philadelphia may have offered a higher salary to Hall, who hit extremely well against the Athletic in Europe. In his first season with Philadelphia, Hall hit .299, with 107 hits, 4 home runs, and 62 RBIs. His play was above average (2.3 WAR) but Philadelphia finished a distant third to Boston in the final standings. The Red Stockings were a major catalyst in the National Association’s collapse in 1875—they were simply too good and attendance waned. Chicago businessman William Hulbert formed the National League officially in February 1876. He viewed the National Association as corrupt, mismanaged, and, worst of all, weak. Hall decided to stick with Philadelphia for 1876, a decision that set up his best season in professional baseball. The National Association’s best clubs from 1875 squared off against one another on April 22, 1876, in Philadelphia. "23 Hall had several clutch at-bats that kept Philadelphia in the game. Regardless, the Athletics dropped the opener to the Red Caps, 6-5. Once again Hall was at the center of baseball history as he played a crucial role in the National League’s origin story. Although the game is now a famous first, Hall’s play in a forgotten game later that season was arguably his best performance. Despite Hall’s success, the 1876 Athletics were a bad team, mostly young and inexperienced. "29 Financial woes hit the club hard, and it failed to complete its scheduled final Western road trip, no-shows for series in Chicago and St. Louis. The club also owed every player between $200 and $500 in back pay. Rumors circulated in Philadelphia that a new club would be organized, using the players from 1876.”30 Hall told the team management that he would stay,"31 but, the Athletics were barred from the National League for the 1877 season, leaving him without a team. Hall soon found a home along with former teammate Bill Craver on the Louisville Grays. The Grays were a formidable team with pitching ace Jim Devlin on the roster. While Chicago and Hartford failed to translate their 1876 success into the 1877 season, Louisville transformed itself from a mediocre team in 1876 to pennant contenders. On August 13 the Grays had a four-game lead over St. Louis with a 27-13 record. St. Louis offered Hall a contract for 1878. (He also expressed interest in joining the Cincinnati nine for 1878.) For whatever reason, he had no interest in signing again with Louisville, even though his salary was a healthy $2,800. "32 Hall was a major catalyst for Louisville’s success in 1877, batting .323, but he was also a major factor in the club’s downfall. The National League never reinstated Hall, and he eventually faded into obscurity. Rumors spread that he continued to play for nonleague teams, but no evidence of that has been founed. Hall moved back to Brooklyn with his wife, Ida, and took up steel engraving, his father’s trade. The couple had six children. Ida died of acute nephritis in 1912 and was buried in Brooklyn’s Evergreen Cemetery. In his later years, George either quit or retired from the engraving profession and became a clerk in a New York art museum. He died of heart trouble on June 11, 1923, and was buried next to his wife. Hall was involved in some of professional baseball’s earliest key moments and established himself as one of the era’s better players. Baseball historian and statistician Bill James labeled him baseball’s “Least Admirable Superstar” of the 1870s. "41 Hall’s role in baseball’s largest scandal of the 19th century continues to overshadow his skill as a player. He completed his career with a .322 batting average with 13 home runs, 252 RBIs, and 538 hits. 1. Hall’s birth date is disputed. Most sources claim March 29, 1849, as his date of birth while his death certificate states that it was June 22, 1849." 2. They immigrated to the United States aboard the Sir Robert Peel. Year: 1854; Arrival: New York, New York; Microfilm Serial: M237, 1820-1897; Microfilm Roll: Roll 143; Line: 22; List Number: 928. "[/fn] George developed an affinity for baseball in his adolescent years in Brooklyn and proved to be an adequate fielder and skilled with the bat. "James D. Smith III, “George William Hall,” from the archives of the National Baseball Hall of Fame and Museum." 4. Henry Chadwick, Chadwick’s Base Ball Manual, baseballchronology.com/baseball/Books/Classic/Henry-Chadwicks-Baseball-Manual/Page-2.asp#70RedStockings1stLoss." 5. “Base-Ball: The Atlantics of Brooklyn Beat the Champions by a Score of 8 to 7 in a Game of 11 Innings, the Rest on Record,” Cincinnati Daily Enquirer, June 15, 1870." 8. Chadwick’s Base Ball Manual." 9. Joe Tropea, “Your Baltimore Canaries: A Very Brief History of Baltimore’s Second Professional Base Ball Team,” Maryland Historical Society, April 3, 2013. mdhs.org/underbelly/2013/04/03/your-baltimore-canaries-a-very-brief-history-of-baltimores-second-professional-base-ball-team/." 10. George V. Tuohey, A History of the Boston Base Ball Club (Boston: M.F. Quinn & Company, 1897), 68; Baseball-reference.com cites, per Preston Orem, that Hall’s salary was $1,000 with Baltimore in 1873 and $500 with Boston in 1874. If this is true, then the financial situation must have been truly perilous for Hall to accept half his salary with an employer 400 miles north of Baltimore." 11. Borough of Brooklyn, New York. Death Certificate number illegible (1912), Ida Aurelia Hall; Bureau of Vital Records, New York." 12. The 1900 US Census states that George and Ida were married for 24 years (1876). 1900 U.S. census, Kings County, New York, population schedule, New York City (page 16), dwelling 280, family 340, George W. and Ida A. Hall; digital image, Ancestry. com, Accessed September 25, 2015." 13. “Baseball: The Players of 1873. Outfielders,” New York Clipper, March 28, 1874." 16. As an outfielder, Hall’s career fielding percentage (.856) was slightly above the league average (.824). His Range Factor per 9 innings of 2.17 and Range Factor per Game of 2.19 were also above the league average (RF/9: 1.99, RF/G: 2.01). Per baseballreference. com, baseball-reference.com/players/h/hallge01.shtml." 17. “Baseball: The Players of 1873. Outfielders." 18. “Boston vs. Mutual,” New York Clipper, May 9, 1874." 19. “Baseball: The Grand International Tour,” New York Clipper, March 7, 1874." 20. Box scores are available for only 9 of the 15 games played in Europe. Eric Miklich, “1874 World Base Ball Tour,” 19cbaseball. com/tours-1874-world-base-ball-tour.html." 21. “Base Ball.” Times of London, August 7, 1874." 22. GRANDMOTHER. “Base-Ball.” Times of London, August 13, 1874." 23. On the first major-league game, see John Zinn, “April 22, 1876: A New Age Begins With Inaugural National League Game,” in Bill Felber, ed., Inventing Baseball: The 100 Greatest Games of the 19th Century (Phoenix: Society for American Baseball Research, 2013), 97-99." 24. “Baseball: Athletic vs. Cincinnati,” New York Clipper, June 24, 1876." 27. Not enough substantial evidence exists to credit Hall with hitting the first cycle in professional baseball. In addition to the Clipper’s account, the June 15, 1876, Cincinnati Enquirer states that Hall totaled 14 bases (four for a home run, nine for three triples, and one for a single). The Times of Philadelphia, June 15, 1876, credits Hall with a home run, two triples, a double, and a single (totaling 13 bases). Major League Baseball Historian John Thorn agrees with the information provided in both the Clipper and Enquirer. The accepted first cycle in the major leagues was completed by Curry Foley in 1882." 28. David Vincent, Home Run: The Definitive History of Baseball’s Ultimate Weapon (Dulles, Virginia: Potomac Books, 2007), 6." 29. William A. Cook, The Louisville Grays Scandal of 1877: The Taint of Gambling at the Dawn of the National League (Jefferson, North Carolina: McFarland & Company, Inc., 2005), 78." 39. “Baseball: The League and Its Work,” New York Clipper, January 20, 1877." 40. “Baseball: League Association Convention, New York Clipper, December 15, 1877." 41. Bill James, The New Bill James Historical Baseball Abstract (New York: Free Press, 2001), 15."